Mountain Wings will provide all of the necessary gear for your training flights. As you progress through the program, you will want to start planning to get your own, so that you will have all of your equipment by the time you do your first high altitude solo flights (Woo Hoo!). Mountain Wings carries both new and used equipment and we are dealers for virtually every product available for hang gliding. Demo gliders are available for those serious qualified students who are interested in test flying prior to making a purchase. Being a hang glider pilot requires that you have your own equipment. One of the advantages of having your own glider early on in your training is that you will be familiarizing yourself with the glider and harness in which you will be doing your higher altitude flights. Students with their own equipment almost always advance more quickly. What you will need: helmet, hang glider, safety wheels, harness, reserve parachute. It is not necessary to buy everything all at once - you can spread out the purchases a little. We recommend getting your own helmet as a first item.The sooner you have your own glider, the more time you'll have to really get dialed in on it! Your instructors can provide you with information and guidance so that you can select the gear that is best for you. Exclusive in the North East! 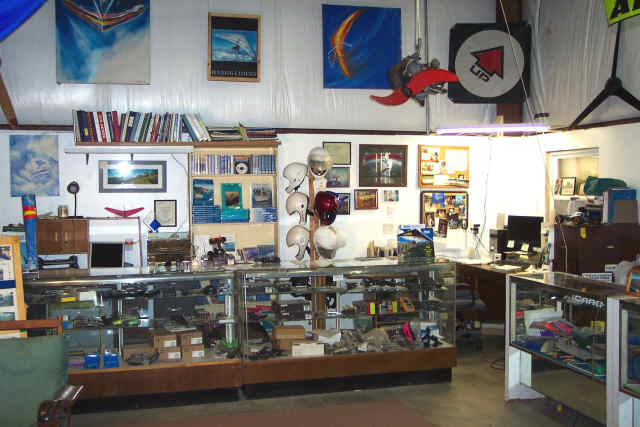 The pro shop offers private bathroom, shower and refrigerator for your lunch, plus a complete retail store for all your hang gliding needs!